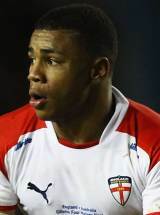 A precocious footballing talent, Kyle Eastmond is the latest rugby league starlet to try his luck in Union. At the age of just 17 Eastmond was training with the St Helens first team and within a year he had announced himself as one of the most exciting young players in the game. Indeed, in the 2008 Good Friday clash with Wigan Warriors, the versatile half-back, who can also play at stand-off, fullback, centre and dumy-half, made headlines with a stunning 60-metre solo score which drew praise from legendary St Helens scrum-half Sean Long. St Helens suffered disappointment in the following year's Grand Final, going down 18-10 to Leeds Rhinos but Eastmond emerged from the game with his reputation enhanced after scoring all of his side's points through a try and two goals. International honours followed a few weeks later, with Eastwood making his England debut in a warm-up game for the 2009 Four Nations against Wales. At the tail end of what had been a hugely successful year for the teenager, he signed a new two-year deal with St Helens. However, towards the end of his contract speculation began to increase that he was considering switching codes and it was announced on February 28 that he had signed a three-year deal with Bath, with whom he is expected to be utilised as a centre. However, upon arriving at the West Country side in the autumn of 2011, Eastmond had to wait for his Bath debut due to a groin injury. After training with the side during December, Eastmond took his bow in early 2012. Come the following season, Eastmond pushed on and established himself at inside centre in the Bath side. With his diminutive, stocky build and blistering pace, Eastwood has long been compared to Jason Robinson - he now has the opportunity to emulate the achievements of the former dual-code international.